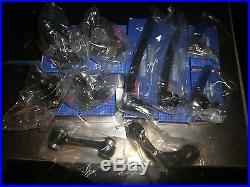 NEW FRONT SUSPENSION & STEERING HARD PARTS KIT SUIT FALCON XT & EARLY XW MODELS. This Sale is for a Full Front Suspension and Steering Hard Parts Kit For all Ford Falcon XT and Early XW (mid 69) Models With Manual Steering.. Difference between early and late XW is the size of the tapers on the tie rod ends.. Consists of Upper and Lower Ball joints.. All 4 tie rod ends..
Idler Arm and Pitman Arm.. All Brand New Aftermarket Greasable..
Castellated Nuts split pins etc.. FIRSTLY - Please note we use normal EMAILS for all our correspondence. To keep you informed along the way. But are usually there before you can track it anyway. If you have a problem or are not sure about something, GIVE US A RING! All our contact details are at the bottom of this page. Once we drop it at the Post Office.. It is up to Austpost.. Or send it via Timbuctoo or you dont pick it up from the Post Office etc etc..
You have bought this knowing it will be delivered by them.. So dont put the blame on us if it goes sideways.. Which seems to be the way of everyone these days.. But if something does happen..
We will do everything we can to help.. We have been trading for over 30 Years , and only sell products of the best quality that we would and do use ourselves. All of our products are sourced from Australia`s leading Auto Parts Wholesalers. What is the quality like.. A note regarding pictures and descriptions on all our sales. All our contact details are below.. We are in Nutfield Victoria.. Rob Mills RINGWOOD AUTO PARTS. Powered by SixBit's eCommerce Solution. The item "NEW FRONT SUSPENSION & STEERING HARD PARTS KIT SUIT FALCON XT & EARLY XW MODELS" is in sale since Wednesday, June 11, 2008. This item is in the category "Vehicle Parts & Accessories\Car & Truck Parts\Suspension, Steering\Other". The seller is "nrap" and is located in Nutfield Victoria. This item can be shipped worldwide.